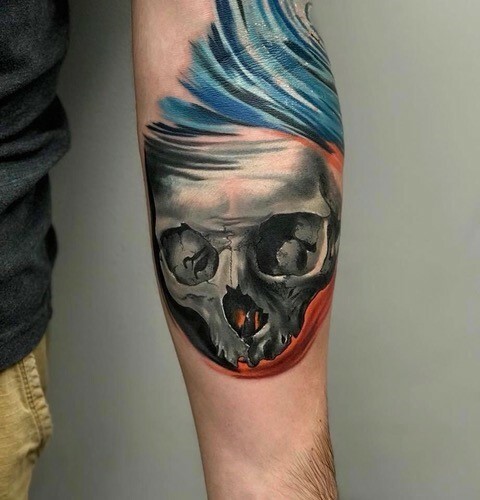 Lark Street Tattoo was established in 1993 and year after year continues to offer the most professional custom tattooing in the Capital District. Located at 278 Lark St. in the eclectic Center Square neighborhood, we specialize in custom tattooing in all styles including cover ups and the modernization of old work. Consultation services are free and we always 100% guarantee our work. Lark Street Tattoo proudly hosts several of the most talented, experienced and versatile tattoo artists, as well as featuring guest artists from around the world. Lark Tattoo firmly believes that the overall tattoo experience should be an enjoyable and relaxing one in a friendly and safe environment. We always welcome individuals wishing to check out our studio and encourage visitors to browse the artwork and artist portfolios. Please enjoy your visit at larkstreettattoo.com We know you’ll agree, these are tattoos even your mother will love. Tom "T-Bone" Martin has been tattooing since 1993. He has a BFA in Sculpture, from Parsons School of Design NYC. He did his apprenticeship with Bruce Bart, Bruce Kaplan and Geeno Mancuso in Tannersville and Albany NY. Says the Bone: “I was an artist from the very beginning of my life. Had an amazing 4 years at Parsons. Tattooing came a little later. I learned how to tattoo in a "street shop", meaning: you've got to be flexible, versatile and willing to listen to the customer. I'm all about customer service and great art. I can take your idea, your dream or rough sketch and form it into a fabulous design on your skin". Kara is a Capital District native. She started with Lark in 2001 and has been a shining jewell in the crown of Lark Tattoo ever since. She is sought out for her beautiful floral, botanic and animal designs. Art Noveau, realism and decorative motifs are some of the places she draws her inspiration from. 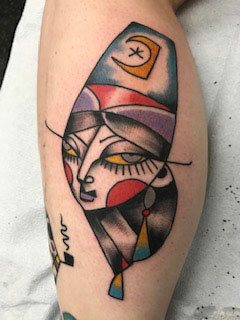 Shelley Darling studied art in high school, and in college, but she was always told it would always be “just a hobby.” When she found tattooing, she immediately realized it was the perfect fit; she could use her love of art and express herself creatively in an actual job. Shelley feels lucky to work with a wide variety of talented artists who have been willing to share ideas and techniques with her while teaching and tattooing her over the years. She loves that tattooing gives her the ability to share art and conversation with clients, and the therapeutic effect it can all have. 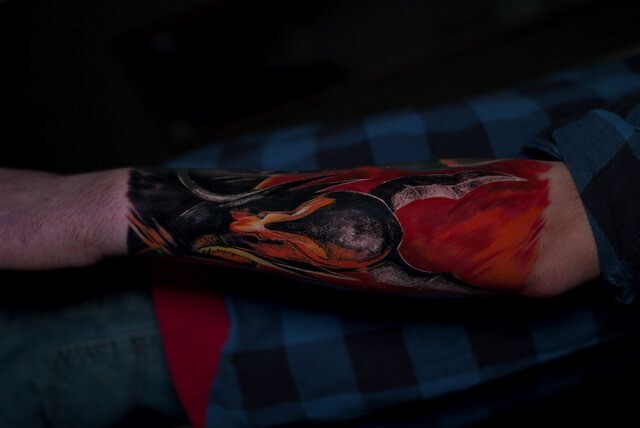 As a tattooer, Shelley loves to play with colors and see how they interact with each other. 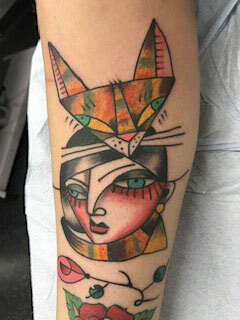 Shelley especially enjoys doing tattoo designs that focus on minimal black work and colorful floral designs. When not tattooing, she loves to read, paint, and garden. Her favorite thing is spoiling her two dogs and one cat, who she adores. A Western New York native, Eric has been tattooing since 2007 and joined us at Lark Street in late 2016. He enjoys doing illustrative, stylized versions of the subject matter in bold, vibrant color. Eric can also knock black and gray out of the park- as seen in his photo. He believes the best tattoos are a healthy collaboration between tattooer and client; as long as it’s a grim reaper. How do I keep my new tattoo looking great for years? 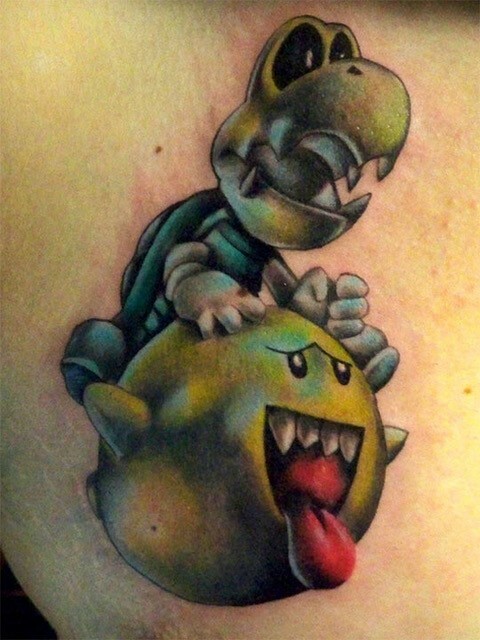 Your tattoo takes 2-4 weeks to heal. During this time, gently wash the tattoo every night and apply lotion to keep the skin soft. We recommend wrapping with plastic for the first few nights. We strongly recommend you make one. Sometimes depending on how complicated a design you would like it is best to make a consultation to work with an artist and plan out your design. Do you require a deposit to draw a design? Yes. To lock in a time or if you want an artist to build you a custom tattoo a $60-$100 deposit is required. This money does go toward the final cost of your tattoo. Deposits are non-refundable so make sure you are all in! You will also lose your deposit if you cancel in less than 24 hours or are a no-show. We are reserving time from our day for you and spending time and brainpower to design you the best tattoo we can so please respect that and communicate with us if there is a problem.